The bids for the Phoenix Coyotes are coming in slowly but surely, despite the July 24th cut-off date. Of course, we have the Jerry Reinsdorf bid for $148M, which would keep the Coyotes in Phoenix. There's a new bidder of Ice Edge Holdings for about $150M, which we'll delve into deeper in a little bit. And, of course, Jim Balsillie is out there just waiting for something to happen with his $212M bid. If we're doing an auction, guess who wins?? Anyway....did you know the Coyotes lost $60M last season alone and people still want this team?? What kind of secret do they have in order to get this much interest?? That last question will be something to be seen, but let's focus on Ice Edge Holdings and their bid. The Great Greg Wyshynski has the break down of it all, including the San Antonio Rampage moving to Thunder Bay. However, the one interesting point is the IEH trying to get some games for the Coyotes in Saskatoon's Credit Union Centre during the regular season and maybe some playoffs games. The capacity of the CUC is 11,300; which is what the Jobing.com Arena capacity should be. But what sense does this make?? Why are you going to move the team for five games to a place as out of the way as Saskatoon, in relation to Phoenix, I mean. May as well have them in Halifax or Charlottetown, PEI for pete's sake. 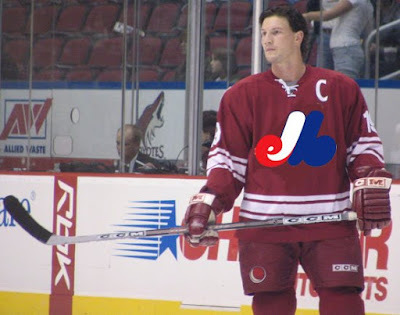 This is my thing though, why is the NHL pulling the same gimmick the MLB did with the Montreal Expos for the Coyotes?? Why are they going to allow something like this to go down and just give a little tease to the Canadian fans only to take it away?? Another big question is what is IEH's grand scale projection?? Let's be honest, this could be a ploy for the ownership brain trust to go to the NHL and say, "Hey, we actually made a profit in the five games in Canada, but lost $xxM playing 37 in Phoenix-- we want to move to (Canadian city here) because it's better for the health of the team and league." And if this is the case, why are we giving the team and fans the run-around like this?? It's hard to have a true home-ice advantage if you're going back and forth. Plus, if you go to a smaller barn and have a ravenous crowd on top of you, then switch back to a big cathedral-esque place with no one in it-- how much of a morale dump is that for the players?? Obviously, we'll have to wait and see what happens and what's going to come from it all, but in my eyes, it's not time to toy around with this team. If you're going to move the team, move the effing team. Let's not string along the fans in Phoenix or the fans in whatever Canadian city they may end up. It's a bad situation on all fronts if you do and it could make the distrust between fans, league, and ownership that much more wider. Call it the lull of the summer, call it the throngs of ideas of Jim Balsillie or some one else not being able to buy a team and the NHL going the expansion route.....call it playing too much NHL '94 with the expansion rosters-- but the Expansion Draft has been going through my head. In order to get this silliness out of my skull, I figure I'll write about it. It may be exciting, it may be crap-- but it's something. Of course, the Expansion Draft is used for teams to assemble a team of players that are the cast-offs of their teams, for the most part. This, of course, has allowed the league to see it's fair share of horrible teams, like the 1974 through 1976 Washington Capitals, the 1991 through 1993 San Jose Sharks, as well as the 1992 through 1996 Ottawa Senators. Yet, it allowed those teams prime draft position to built their team the way they want to and develop players through their own systems. It's may be because some of the players are awful, but some guys step up and actually show their true worth. It seems that most of the success stories that happen in the net. Of all players selected, it seems that goalie come out smelling like roses. It started with Glenn Hall being left unprotected and helping the St. Louis Blues get to the Stanley Cup finals in his first year and second years there. Then you have guys like Billy Smith and Arturs Irbe, both who got selected and had to go through a couple years of hardships before fully flourishing. The two goalies of the 1993 Expansion Draft, John Vanbiesbrouck and Guy Hebert, both immediate became the face of their teams. Beezer was pushed out of Broadway by the Rangers with Mike Richter coming of age, yet make a mark in Miami, while Hebert was stuck behind Curtis Joseph in St. Louis before getting his shot in Anaheim. Meanwhile, Tomas Vokoun had to wait for Mike Dunham to move aside to show his way in Nashville. While not all success stories are goalies, not many skaters seemed to be the big names from Expansion Drafts. To an extent, Pat Quinn played a big role in both building the Vancouver Canucks and Atlanta Flames, as he brought his hardnose game and a little bit of passing touch to those teams. Scott Mellanby seemed to get new life when picked by the Panthers, being a leader on and off the ice, while Scott Walker found a sort of scoring touch to his physical game while in Nashville. Those are the guys who jump out in a good way. For the downside of things, Bill Mikkelson had the worse luck with the Expansion Draft. Mikkelson was drafted twice, first in 1972 by the New York Islanders and then two year later by the Washington Capitals. 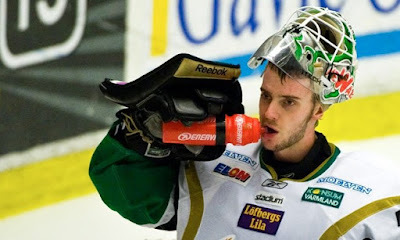 Prior to these, Mikkelson played 15 games for the Los Angeles Kings and had an assist and was a minus-11. Mikkelson played two more years, in '72-'73 and '74-'75, to which he compiled four goals, 18 assist and a whopping minus-136 (minus-54 and minus-82 respectively) in those two seasons. Wow....is pretty much all you can say. But, Mikkelson was one of the few who was drafted through the Expansion Draft more than once. Quinn was taken twice in 1970 and 1972. Ron Low was picked by the Capitals in '74, while being picked in '79 by the Quebec Nordiques when they moved from the WHA. The most intreging Expansion Draftees was Frederic Chabot was picked three times, first by the Tampa Bay Lightning in 1992, then by the Nashville Predators in 1998, and finally by the Columbus Blue Jackets in 2000. However, a misconception is Andrew Brunette, who was selected by the Predators in the '98 E-Draft, but signed with the Thrashers in their first year even though he wasn't picked in 1999's E-Draft. Again-- those are the names that jump out, while I think in the earlier days they had plenty of guys jumping to and fro. If I was a real journalist and/or researcher, I'd take time to do all the leg work.....but here we are. As an aside, the 1991 Expansion Draft had a Disperal Draft as well. It had to do with the owners of the Minnesota North Stars wanting to move the team to the California Bay Area, but was rebuffed by the NHL. To compromise, the NHL gave the owners of the North Stars an expansion team in San Jose, but a condition of the owners selling the team; the Sharks would have a first shot at some North Stars players before taking the league pool of players. This is just boredom taking over, I'm sure-- but it would be interesting to see what guys would be left unprotected nowadays. Right now, the talent pool for every team is very deep and the skill level of kids is spectacular, that you may not have the hiccups that these first expansions or middle of the road expansion teams would have had. We have seen that with the recent expansions teams, aside from the Atlanta Thrashers first season, the teams have been somewhat competitive and not as awful as some people would have thought. With the talent, the management, the style of play nowadays-- the next expansion draft could be the most exciting one to date. Everyone has been a-buzz when it comes to the NHL schedule coming out. Me, I've been alright with it. I'm letting it soak in since we won't see action until September training camps, so I don't wanna get my hopes up in mid-July. However, having digested the schedule for a short time, I've got some games for you folks to mark down on the calendar.....or not. For those wondering, the arbitrary number of seven is in honor of a friend who hit trip-sevens on Wednesday morning. October 28th: Toronto Maple Leafs vs. Dallas Stars-- This year's highly touted Swedish free-agent meets last year's highly touted Swedish free-agent as Jonas Gustavsson faces off against Fabian Brunnstrom. No truth to the rumors that Brunnstrom will tell Gustavsson to beware the Ides of November....right on through until the end of April. November 10th: Edmonton Oilers vs. Ottawa Senators-- Odds are in favor of Dany Heatley will be playing in this game. For which team-- that's anyone's guess at this point. Yet, both teams could be out of the playoff contention and dealing with goaltending issues by this point in the season. November 16th: Tampa Bay Lightning vs. Phoenix Coyotes-- If there was a game to be played in a three-ring circus, this is it. What, with the mess that we all know the Tampa Bay Lightning is and the debacle in the desert that is the Coyotes; boy howdy-- put a tent of that circus. And who's to say either of these messes will be cleaned up by then, which will make this much more fantastic to me. December 2nd: Vancouver Canucks vs. New Jersey Devils-- With Jacques Lemaire back behind the bench for the Devils and the Canucks' defensive posture-- this could be the only documented game with negative scoring to take place. January 1st: Philadelphia Flyers vs. Boston Bruins-- This game will be the Winter Classic, yes. However, it will be seen if anyone can survive the "Monster Drinking Game" with Pierre McGuire at Fenway Park. Plus, it could be the first Winter Classic where the action in the stands between the Philly fans and Bostonians could outweigh the action on the ice. February 7th: Pittsburgh Penguins vs. Washington Capitals-- Now, this game is one to watch if the Steelers make it to the Super Bowl (since it is Super Bowl Sunday), because it could mark the first time the Capitals would have home-ice advantage in Verizon Center in a game against the Penguins for the longest time. Of course, if the Steelers don't make the Super Bowl, this all goes out the window. April 11th: Edmonton Oilers vs. Anaheim Ducks-- This is the last game of the regular season and could be a deciding game for both of these teams. However, this could be the most insignficant game out there if both teams are locked into their position. It could go either way, but it will prep us for the playoffs if it's a barnburner. Oddly enough, the Ducks and Oilers will have the last game before the Olympic break too on February 14th. This is the second part of the update of the FOHS Draft show with Lyle Richardson, Greg Wyshynski, and Princess Curl. Of course, Montreal will bring out the best in everyone, which is why you can tell we’re getting a little wild, which is when the fans came in because they knew the game was on. Like I said in the first part, caution due to some language-- if you’re opposed to that. In this first part, we continue to talk about blogging, but this time when it comes to the perception given off from the mainstream media types. The second video in this cluster has to do with what’s going to happen in the off-season when it comes to topical ideas and how to keep the creative juices flowing. This third part is a little dated, but it’s a hardy debate. When the topic of the Sedin twins came up and the length of the contract, it sparked the question about how long is too long (wocka) and whether spending that amount of money on two players is rational at all in a salary cap world. So, we at the Face Off Hockey Show went to Montreal for the Draft, Jonny P and I got credentialed, and we did a show. For the show, we got long-time colleague Lyle Richardson, Puck Daddy czar Greg Wyshynski, and lady-of-all-trades Princess Curl to come in and do the show. Here's a portion of the insanity where we talked about this draft being the "Twitter Draft", as well as bloggers being put into play when it comes to being credentialed. This portion is about 30 minutes long in four segments because YouTube doesn't like anything over ten minutes-- which most guys would love. Also, caution because some language is a little bit gritty at times. From left to right: Greg Wyshynski, Marc "with a 'C'", Lyle Richardson, myself, Princess Curl (off-cam most the time and raspy voiced) and Jonny P as the rover. 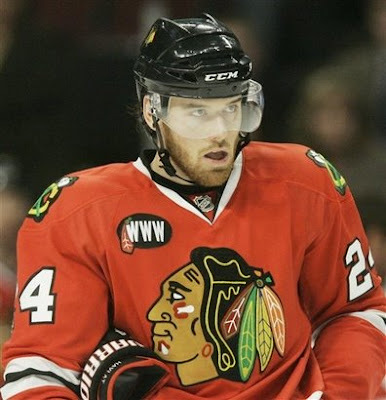 The "Twitter-verse" asploded today, with Martin Havlat giving an inside look to what's going on with the Dale Tallon/Stan Bowman/Chicago Blackhawks fiasco. Mirtle has a brief overview of what's happening and what Havlat said. While this is great for fans to get an inside view to the happenings, turmoils, and pretty much grudges that come out from one player leaving a team because he felt he was disrespected by the organization after giving his all for them; is this the right medium to do it in and what precedent does this put out there for other athlete's who are pissed off at their teammates, coaches, and front office?? To drop a name or so, I've done some stuff with Havlat when he did his FHM Online thing while I was doing my thing for FHM. He's a great guy and he's a straight-shooter. However, I don't think he knows what he's could be getting into by doing something like this-- especially after he ripped the franchise for not giving him a better offer in order to keep him in Chicago. If he does this now, on his own, off of pure emotion-- it could come off as sour grapes and bitterness toward the Hawks-- which could be the case, but isn't the right light he should be portrayed in. The fine line that Havlat is walking is going to be something that will be very showing of how he is treated for the rest of his career. Should Havlat air this "dirty laundry" off of pure emotion-- how do you think the brass of the Wild or whoever else he plays for will treat him?? How inside do you think he'll get if he goes off on a tangent about how the Hawks are run and what happened?? More over, how trusting will his teammates be if they know he's capable of tweeting about their mishaps or what-have-you?? Sure, those are extreme situations, but at the same time-- it may not be out of the realm of possibility depending on what he does with this Tallon situation. We talked on the FOHS Draft Show (being fixed in "post", as they say) about the new dimension that Twitter brings to the table with teams tweeting their picks and trades, but this is bringing it to another level and could be a landmark situation we're getting into. It'll be interesting what Havlat does in terms of information given and what could be done afterwords in terms of deleting and not recognizing these tweets at a later time. All of the people follow Havlat will await with bated breath.....even if he only can use 140 characters and needs to abbreviate like a mofo to get what he wants to say across to the masses. Best of luck with this, Marty-- but at the same time-- there's a better medium to go about it, should you choice it. 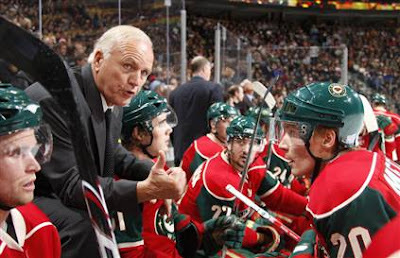 The New Jersey Devils announced today that they have hired Jacques Lemaire as their new head coach. This is going to be something, as the Devils are going through a transition period and have a stellar new goalie coming up by the name of Martin Brodeur. Something tells me this kid will make a name for himself soon, boy howdy. Huh?? Oh, I'm sorry, I thought this was 1993 when this sort of thing happened the first time. But alas, it's 16 years later and 11 years after Lemaire ended his first reign with the Devils after the '97-'98 season. One of the questions in this move is whether or not this is a smart decision. You have to wonder why the Devils bring in a guy who hasn't been the most successful in his coaching career. Sure, his technique and tactics are that of legends, but when you look closer at his history behind the bench, you soon realize that for a team that has had issues in the playoffs the past two seasons, Lemaire could be a step backwards for this organization. Though in his 15 seasons, Lemaire has gone 538-415-176 and one Stanley Cup with the Devils to show-- he has missed the playoffs in six seasons (three times in the last five seasons) and has only gotten out of the first round in six seasons, most early in his coaching tenure. The fact that Lemaire is more defensive minded and has missed the playoffs in three of the last five seasons, it could be a telling sign that time and the game has passed him by. Especially for a team like the Devils who have had their share of issues when it comes to the playoffs recently-- you wonder why they make this decision over making longtime assistant John MacLean head coach with the big club, aside from putting him down on the farm in Lowell. While putting MacLean in Lowell is a start, you'd have to think he was a top contender considering his time he's put in as an assistant and how well he knows what's successful and what's not with this group of players. But it's not something that will be new territory with this team. Aside from Zach Parise (and maybe Patrik Elias), there's not that much offensive swagger for the Devils to exploit anymore. This way, you have to figure that there's not going to be too much of an issue with the Devils going more defensive or there's going to be that much of a shake-up going from one style of play to another. Parise's numbers will probably suffer, sure, but if the Devils are going to rack up wins, I think the personal stats will be put aside for the time being....until the style wears out its welcome and changes are made mid-season. Obviously, only time will tell how much the Devils will change and how the response will be from players and fans alike. The one thing I would have suggested is leaving the past in the past. Sure, Lemaire has a legacy and changed a lot of thing in the coaching game when defensive hockey was the order of the day, but when will people see that bringing back the past often creates more problems than solutions. Even though a coach has a ring from the past, it doesn't automatically mean they will be successful in the present day-- right Mike Keenan?? All the best to Lemaire in his new venture with the Devils, but for the fans out there-- you may want to hope that somewhere between Minnesota and New Jersey that Jacques picked up some high-tempo scoring techniques or realized that maybe offensive isn't that much of a bad thing in the end. 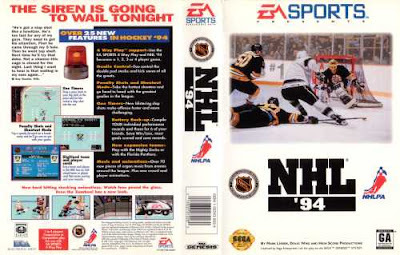 With Joe Sakic, Claude Lemieux, and evidently Mats Sundin all calling it a career this week (or will eventually....we're looking at you Mats), you can almost tell that the era of NHL '94 could be in its twillight. It's almost like the "Tecmo Bowl" in football, NHL '94 seems to be the gauge on how old we all are and why we won against the computer with the offsides turned off. So, with those three big timers leaving-- who is left amongst those where were in NHL '94. And yes, I'm well aware that didn't make sense-- there were nouns and verbs, but all jumbled together. Deal with it. ANAHEIM: Sean Hill-- While Hill is buried over in Switzerland, he is still somewhat active and will be added to this list. Although his 44 rating was hurtful, he was great for an expansion team. BUFFALO: Brad May, Dominik Hasek-- May is a free agent and could be off this list soon, but odds are someone will take a chance. Way down the list due to skill, May was a scrapper and you only put him in if you had to make a line-change. Hasek was the second stringer behind Fuhr and with his unretirement to play in Czech Republic-- he's back on the list. CALGARY: Robert Reichel-- Good catch by a reader (Comment #14), as Reichel is still over in the Czech Republic. He was never a flashy guy, but a solid contributor and a leader on the ice as well. Going back home has given him a shot in the arm and some certainty when it comes his role in the line-up. CHICAGO: Jeremy Roenick, Chris Chelios-- Both of these guys could be gone in a second, but both were studs in NHL '94. Roenick was the top forward, Chelios the top defender on the Hawks and knew how to rip it up. It's not so much me as it is Roenick-- he's good. DALLAS: Mike Modano-- Modano is back for another season and continues to be somewhat consistent, much like he was in the game itself. Along with Russ Courtnall and Dave Gagner, the Stars appeal was only up-front as the rest of the team was abysmal. DETROIT: Sergei Fedorov, Nicklas Lidstrom, Slava Kozlov-- While Kozlov was still getting a taste for the NHL, Fedorov was a stud and Lidstrom was starting to get noticed. Though Feds is back in Russia, Lidstrom and Kozlov motor on in the NHL. EDMONTON: Doug Weight-- Weight is still around on Long Island, but who knows how much time he will have left. A top guy for the Oilers, he could be the only guy who was a starter, but was not in the top three ratings for forwards. HARTFORD: Michael Nylander-- Though many still hate him in DC, Nylander is the last Whale player from this game and it's almost sad to think really. LOS ANGELES: Rob Blake, Alexei Zhitnik, Darryl Sydor-- All defenseman, but only Blake and Sydor remain in the NHL-- Zhitnik is in Russia.. For a team with great up-front presence, the back line wasn't too shabby either. MONTREAL: Mike Keane, Mathieu Schneider, Sean Hill-- This was the thing with NHL '94, you had expansion teams, but they kept the player on their team from the year before-- like Hill. Keane is still toiling in the minors, while Schneider remains in limbo, as he is a UFA. NEW JERSEY: Bill Guerin, Scott Niedermayer-- Both of these guys were deep in the depth chart because they were on the younger side, but now they have both flourished throughout. Niedermayer was being Bruce Driver, for pete's sake. NY ISLANDERS: Darius Kasparaitis-- He's still around, folks-- albeit it in Russia, but it counts. A top d-man on a subpar team, his hitting was used to keep people away from Glenn Healy and his 47 rating. NY RANGERS: Alexei Kovalev, Sergei Zubov-- Kovalev just signed a new deal in Ottawa, while Zubov has been sturdy at times, but fragile in others. Both young bucks in '94, somehow stuck around. PHILADELPHIA: Mark Recchi, Rod Brind'Amour-- Recchi has one year left in him and will soon be off this list, while Rod "the Bod" could outlast everyone else because of his insane conditioning. It would be the great honor to be the last '94ers around. PITTSBURGH: Jaromir Jagr-- Though he's in Russia, he has thought about coming back. It would be interesting to see if he still had it if he did-- but don't get your hopes up; looking at you, Edmonton. QUEBEC: Adam Foote, Owen Nolan, Chris Simon-- Simon is toiling in Russia, but both Foote and Nolan are veteran leaders in Colorado and Minnesota, respectively. Foote made a tour stop in Columbus before coming back to Colorado. SAN JOSE: Sandis Ozolinsh-- Ozo is in Russia, like many others, to play out the end of their careers. ST. LOUIS: Brendan Shanahan, Bret Hedican, Curtis Joseph-- All three are UFAs, all three could be gone in a split, especially Shanahan and Joseph. Hedican may have some left in the tank, but who knows how this could come out come next season. TAMPA BAY: Roman Hamrlik-- Hammer is still getting it done on the Canadiens now, but could be playing out the last few years on this list. Though he's done better in the past few years, you wonder how much this luck can last. VANCOUVER: Petr Nedved, Jiri Slegr-- Both of these guys are back in the Czech Republic, but both had their moments for the NHL. Built for speed, these guys could wheel in the 16-bit world. WINNIPEG: Teemu Selanne, Keith Tkachuk, Teppo Numminen-- All three guys are still kicking it and kicking it pretty well. Though Selanne has been indecisive, Numminen has had health issues, and Tkachuk has been at the buffet-- they round out a great trio of players around in the NHL. While there's still a decent amount of players out there-- they could all be gone within two years....tops. It's something where it's a loss of innocence for hockey fans of a young age who grew up to love this cult-classic game. So, now I'm taking bets on who will be the last player to play who was rostered on NHL '94. UPDATED ON DECEMBER 29TH 2009!!! Though the title may be misleading, this isn't about how you can get Pierre McGuire to come out of his little box between the benches so you can punch him, nor does it have to do with my own personal things (wocka, wocka), but how you can get Jonas "The Monster" Gustavsson on your roster and lead your team to victory. Gustavsson is the prized Swede of the summer, following Fabian Brunnstrom last season, which could spark warning signals considering how inconsistent Brunnstrom was with the Stars. It's a risk/reward situation when you bring a European trained goalie into the NHL. By all accounts though, Gustavsson will be fairing just fine in his new dig wherever they may end up being. Plus, since he'll be seen as a franchise goalie, the odds are that the team will build around him and give him what he needs to feel protected. That was the main issue why he said he was going to wait until after July 1st to sign with a team, in order to see which of his suitors would give him the most help in his first years over in North America. You can bet that after hearing that news, any kind of other plans the Leafs had on the free agent market went into the can when they heard that news and focused on giving their goaltender some help, whoever it may be. However, to say they aren't hoping for Gustavsson to sign in Toronto is silly. That's the main thing they are gunning for, it seems, with the signing of two defensemen of the "shut down" style of play. Mike Komisarek and Francois Beauchemin will provide grit and solid defensive play for whoever is in the Leafs net this season, and if it happens to be a rookie Swede who was wooed by the two signings....sobeit. The question remains on if the young Swede will go to a place where the defense is better or if it's a balanced system. There's the flaw by the Leafs, who do have a solid defense now, but the fact remains they don't have many guy who can bury the puck in the back of the net. If Gustavsson cares about goal support, that could be a detriment to the Leafs push in signing him. But who else is out there for Gustavsson?? Depending on who you listen to, it's down to four teams: Toronto, Dallas, Colorado and San Jose. The issue with the Stars and Sharks is Marty Turco and Evgeni Nabokov respectively, both who have time left on their contracts and both of whom are workhorses. If Gustavsson wants playing time, he probably wouldn't want either of those teams. Colorado needs a solid goalie, but their hinderance is the lack of defense......or much of anything for that matter right now. It may take time and Gustavsson may be willing to grow with the team, but who knows his mindset. That leaves Toronto, and we know Burke wants this kid bad because he focused so much on the defense and he's gone over and visted with him a couple times from April. He could be a cornerstone to the franchise, which is what the Leafs need in net. While we await the decision, another thing is the Brunnstrom comparison I made earlier. It's harder to develop goalies into the NHL, especially if they have never played in North America prior. The risk you take with Gustavsson is that you throw him into the starting role much too early and ruin the kid's development in the process. It's a big deal to wonder if the chase is worth him being mediorce when all is said and done. Only time will tell how Gustavsson will fare after he choose where he will go, but everyone in the hockey world will await with bated-breathe to see if the "Monster" will live up to the hype made by some. Habs fans' hearts are a-flutter with the moves made by Bob Gainey in the past week. First, it started with Scott Gomez being traded to Montreal and has followed with the signings of Brian Gionta and Mike Camalleri, which could be a sign of a new offensive outlook for the Habs. Of course, their loss of Mike Komisarek is a hit on the defensive side, but the lack of sturdy offensive production needed to be addressed....apparently. 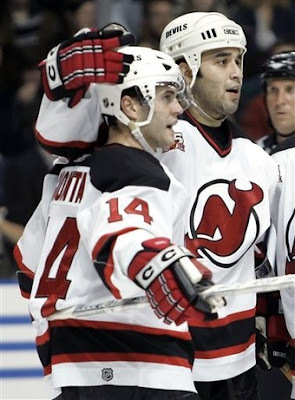 However, the thought of a reunion of the magic that Brian Gionta and Scott Gomez had in New Jersey could give the Habs faithful belief that it is still there even though they had spent two seasons apart. Considering they were solid the year after the lockout, but crashed the next season-- why is there such a buzz about the magic they had-- it was one good year. Albeit, the one good year is all it takes in some cases, but we're getting away from the point. Was this move to sign Gionta after the trade for Gomez used in order to get the tandem back together?? Because if it was, it may have not been the best move. Sure, the chemistry they may share is a nice tool to have, but to believe that lightning can strike more than once is a little silly and short-sighted. Lest we not forget the fiasco that happened in Colorado with Teemu Selanne and Paul Kariya in '03-'04 which was going to be used to spark the offense, but turned out to be a horrible, failed experiment. While there are other tandems who were successful at the end of the day, odds are that if they have been apart for a time; the magic doesn't come back as it once did and will hinder a team's fortunes rather than help them. With the pressure to successed coupled with the pressure put forth by the media and fans alike; you can almost think that this is a recipe for failure for Gionta, Gomez, and ultimately the Habs. Of course, that failure could be Gainey's last stand-- but only time will tell if it'll be a risk that pays off for Gainey or not. If I'm Dany Heatley, I'm quoting Gob Bluth right now: "I've made a huge mistake." He has to be feeling that way, what with the fiasco that has gone on in the past few weeks with word of him requesting a trade out of Ottawa being leaked to the media, then Sens' GM Bryan Murray getting a deal in place with the Edmonton Oilers, but Heatley then blocking the deal due to his no-movement clause. Now, reports are coming out that the Sens could file a grievence because Heatley demanded a trade, then wouldn't lift his NMC; which I don't know how they'd win that one since Heatley was in every way right to keep his NMC clause in tact, but still-- this is turning into a bigger circus than it needs to be. Now, with the July 1st deadline come and gone for the roster bonus of $4M owed to him, you wonder if Heatley will play the loyalty care of figure out a way to sneak out of town like the Baltimore Colts did in 1984. It's not like they can send him to Binghamton with his NMC in effect, which would not only bury him, but bury his contract-- and they could suspend him without pay if he refuses to show up to camp when it starts, but odds are he will, whether they want him there or not. Of course, that last scenario is pending on whether or not he's been traded prior to the Sens camp. Yet, you look at this and you wonder how the Senators always get into trouble with a superstar player clashing with management. The Alexei Yashin drama was just getting out of the heads of some Sens die-hards and now-- it seems that Heatley is turning into Yashin 2.0. Sadly, Mike Milbury isn't around to make a horrible deal to the Sens in order for the Sens to save face. Albeit, also Yashin was his own worst enemy, Heatley isn't up to that level....yet. While Heatley is claiming philisophical difference between him and coach Cory Clouston, did Heatley really expect things to be the same as they always were with a new coach behind the bench?? Especially considering the Sens haven't had a stable coach since Jacques Martin was given the boot. This is the fourth straight season with a new head coach to start the season for the Sens and you'd think in that time, Heatley would realize that they would be differences with the revolving door that's at the ScotiaBank Place. Though considering his numbers have been on the decline in the past two years (154 points in past two years in comparison to 208 points in first two years), maybe it's time to sell now. Sure, it's an ego hit and payroll hit due to the $4M bonus, but if he's going to continue to slide on the team, as well as be a disturbance in the locker room, let him make a deal for himself and that way everyone can be happy. There's plenty of blame to go around for this situation to go as nuclear as it has been, with loose lips sinking ships, but ultimately, Heatley is one who is going to villified when all is said and done. He may not like the situation, but he couldn't expect that things would stay the same when he signed his six-year extension, especially in this day-in-age for the hockey business. The fact he's not willing to take a lesser role or accept change under the helm of Clouston also shows to some that he may not be a team player and is only in business for himself-- which I'm sure plenty of teams will be scrambling to get (sarcasm). Donning my Sens fan cap for a second, I say you see what happens in the months leading up to camp. Feel out the process, while listening to offers and seeing which one would help the team out more and which Heatley would be willing to go for. If he still balks at the idea, you keep him on the roster and gauge the interest of his teammates as camp draws closer. Then you can see if he does show up to camp and go from there. If he does show up and his teammates want to see how it goes in the first part of it-- then observe and roll. If they have a pure detest for him, then hold him out of camp and see what deal you can scrounge up. Of course, should Heatley not report, then you suspend him without pay and rework as needed. The end of this all will have everyone involved licking some sort of wound, some wounds bigger than others. Whether it's Bryan Murray, Dany Heatley, or even Cory Clouston-- there's going to be a lot of finger-pointing and armchair GMing to go around for the aftermath....if there is an aftermath.